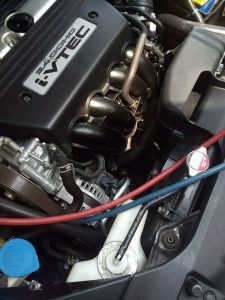 When the summer hits your place,then we would go for the car A/C system repair work in our to do list.Here are the tips to guide you through the diagnostic process with the information to replace the A/C compressor or recharge and clean the a/c system. First you need to eliminate the clutch in your A/C compressor as the culprit.Turn on your A/C and fans to max settings. Is the clutch engaging properly or not ? If not,use a voltmeter to see if the compressor is receiving voltage. If there’s voltage, the clutch may be worn out. Replacement of the clutch and/or compressor would be necessary. 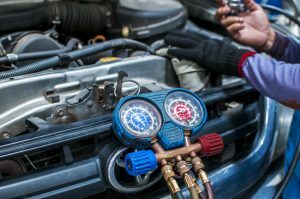 If there’s no voltage, there may not be sufficient refrigerant in the system to engage the low pressure cut-off switch that cycles the compressor. If it seems likely that there isn’t enough refrigerant in the system, the typical culprit is a leak. Use a UV A/C leak detector kit to check for leaks, including in the condenser and evaporator. If you need to replace your A/C compressor, you’ll also need to replace your accumulator and/or dryer and expansion device. You’ll also want to conduct a full flush of the system for optimal performance. Some vehicles require a replacement of the condenser to eliminate all debris from the A/C system. The EPA provides detailed information about the process and regulations. You can read them in full or use the summary we’ve provided below. It’s possible to have pinpoint-sized leaks that are very difficult to find, even with the best equipment. These tiny leaks cause slow leakage but the A/C system may seem to lose its cooling capabilities virtually all at once. If that’s the case, it’s likely that your vehicle has a system that shuts off once refrigerant drops below a certain level. If you decide to just add refrigerant, A/C Pro is a solution to consider. It contains a sealant that helps stop leaks on hoses, gaskets and o-rings. We at Doers would take care of the A/C repairs and maintenance at the city near you just click on www.doers.co.in and book the service today.